The 18th APhO was held in Yakutsk, Russia from 1 – 9 May 2017. Our students secured one Silver, four Bronze and three Honorary Mentions. Delegation was led by Dr Wang Qinghai (IPS & NUS), Dr Chen Zilong (IPS & NTU), Ms Chan Kwee Yong (MOE/NYJC), Mr Chng Chia Yi (MOE/MJC), Dr Zhiming Darren Tan (IPS & MOE/CPDD). Also in photo: President of APhO, A/P KWEK Leong-Chuan (IPS & NIE & NUS), and his wife. Singapore Team at APhO 2017. Singapore Team at APhO 2016. The 17th APhO was held in Hong Kong from 1 – 9 May 2016, hosted by the Hong Kong University of Science of Technology. Singapore was ranked 3rd (based on a simple medal tally) behind China and Taiwan, out of 26 countries that participated in the competition. Our students secured two Gold medals, three Silver medals, and three Bronze medals. 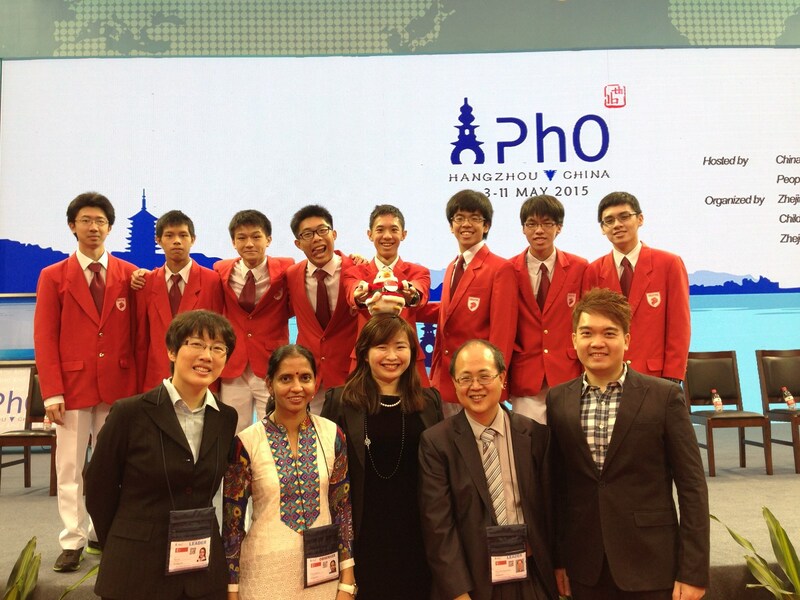 The 16th APhO was held in Hangzhou, China from 3 – 11 May 2015, hosted by Zhejiang University. Singapore was placed 2nd out of 25 countries with six Gold medals, one Silver medal, and one Bronze medal. Garett Tok was awarded the “Most Creative Solution in Theory”, sponsored by the Materials Research Society (Singapore). Singapore Team at APhO 2015. Singapore Team at APhO 2014. The 15th APhO was held in Singapore from 11 – 18 May 2014. The Singapore team won three Gold medals, two Silver medals, one Bronze medal and two Honorary Mention awards. Qu Xinyi won the award for best female student participant. The team was led by Lim Zhi Han and Tao Ye. Singapore Team at APhO 2013. The 14th Asian Physics Olympiad was held in Bogor, Indonesia from 5 – 13 May, 2013. The Singapore team, led by Lim Kim Yong and Lim Zhi Han, won three Gold medals, two Silver medals and 3 Bronze medals.